The political resolution sought to dispel concerns over the state of the economy and praised measures like GST and demonetisation. 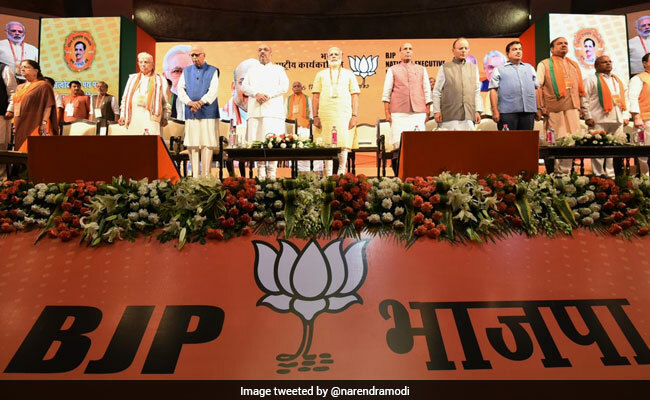 New Delhi: The BJP today adopted a six-point agenda, seeking to rid the country of poverty, terrorism, casteism, communalism and corruption, to realise Prime Minister Narendra Modi's vision of a new India by 2022, said Union minister Nitin Gadkari. The political resolution, passed at the party's national executive meeting, also sought to dispel concerns over the state of the economy and praised measures like GST and demonetisation. The party supported the government's stand on the Rohingya issue, saying it fulfilled its responsibilities by providing humanitarian relief to Bangladesh for Rohingya refugees while ensuring that internal security was not compromised for its 125 crore citizens. The resolution, Mr Gadkari told reporters, also regretted the opposition to the Modi government's move to grant constitutional status to the OBC commission and asserted that the BJP would achieve it. It claimed the government had "delivered" on its promise on corruption and black money, adding that demonetisation, a move which invited sharp criticism from opposition, "broke the backbone of black market as well as the black money hoarders". "The overwhelming public support for demonetisation needs to be underscored," the resolution said, adding that it paved the way for strengthening the foundations of a transparent economy. The Central government's policies had brought rewards for honesty in public life and the government deserved rich compliments for bringing in a transparent economic system, the resolution stated, praising the roll out of the GST which led to "one nation, one tax". The resolution also heaped praise on Modi over the government's handling of the Doklam stand-off with China and the way he has highlighted the issue of terrorism globally, isolating Pakistan and exposing terrorist organisations like Hizbul Mujahiddin. The national executive welcomed the fruitful dialogue between between PM Modi and Chinese President Xi Jinping and referred to the success of the government's foreign policy due to which terrorism was at the forefront in the resolution passed at BRICS summit 2017. The BJP government with its humane and sensitive diplomacy has improved and strengthened bilateral relations, it said. Discussing the party's six-point agenda, Mr Gadkari said, "The party has decided that working towards six goals will be its mission to help realise the prime minister's vision of a new India by 2022." Having a clean India free of litter is one of them, he added. Asked about concerns over the economy following the fall in GDP growth rate, Mr Gadkari, a former BJP president and one of the government's most senior Union ministers, said some "teething problems" happen when major reforms are undertaken. "The government is consistently resolving difficulties being faced by the people and the traders during the initial period of the implementation of this tax," the resolution said. On the Kashmir issue, it said the government had achieved a "remarkable balancing act" by showing no mercy to terrorists while displaying a marked degree of sensitivity towards the common man being used by terrorists. It referred to the announcement of a Rs 80,000 crore development package, two AIIMS, IIMs, IITs, five medical colleges and an engineering college for Jammu and Kashmir, which, it said, would give an impetus to the state's development. The national executive also hailed the government for its efforts for the "upliftment" of women, enabling them to live a life of dignity. Women-centric schemes like 'Beti Bachao-Beti Padhao', 'Sukanya Samaridhi Yojana' and 'Ujjwala Yojana' had directly benefited more than three crore women. The resolution condemned violence against BJP workers and cited attacks on the party's activists in Kerala and West Bengal. The government's initiatives for welfare of farmers and youth development for nation building found mention too.